I love this abstract print Anthropologie top (similar), that I swapped for at our blogger meet-up in Phoenix. I wear it a lot with jeans, but when it’s too hot for denim, I wear it with a full or pleated skirt ( this one by Theory was thrifted; sim here). A thrifted green bangle (sim) and black bead/tassel necklace by Suzanne Carillo are all the jewels I need. The flat ankle-wrap sandals (sim) add a dash of contrasting color. What are your favorite seasonal classics? Hair by Ellen Wille, my current favorite. Previous Article← Almost Free Frugal Friday Finds! That shade of green suits you so well Patti, and that’s great shape of skirt to wear with the top, perfect x Thanks for the link up party! Looking beautiful in that green top, Patti! The color really suits you! That green shade is epic, I love it! Such a cooling shade. Fabulous look and that skirt is just perfect. Enjoy. Looking lovely in your emerald green print cami and skirt, perfect for your climate. Your weather is much the same as our Aussie Northern areas , me I so enjoy our four distinct seasons but pleased our Winters are fairly mild. Many thanks for hosting Patti. 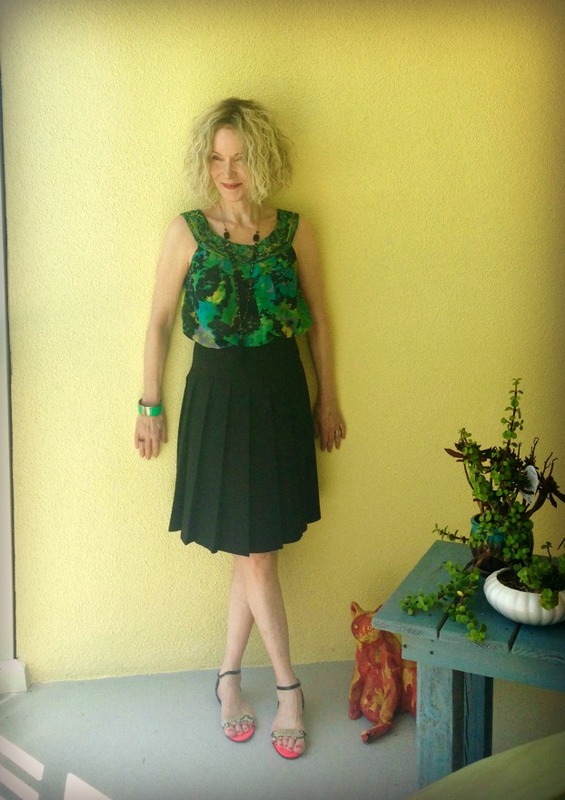 Shades of green are so pretty on you Patti…love the top! It would be challenging to dress for warm weather most of the year; I much as I’m not a fan of super frigid temperatures, I do appreciate the chance to mix up the fashion choices. I am having major weather envy and I live in Italy! It’s been raining so much here and I need the sun…you look lovely Patti, green suits you =) Kisses and thank you for hosting the linkup! Very pretty! Love the entire outfit, cuff bracelet and sandals with the coral lining included, on you. Love your hair style too (it made me want to go have a perm to my straight as stick hair again :-)). Well, I have also something green in my closet! Love your outfit! Fantastic colors! Patti, its getting warmer here in NC too. I LOVE the top on you, such great colors and detail. Thats what I love about Anthro, and you find such great pieces through thrifting. Darling sandals too! Stunning top and sandals Patti, you don’t need a lot of jewelry with a great look like that. What a lovely color on you! It’s the opposite in Seattle – we only have a few months of warm weather, but I’m always drawn to pretty tanks like this one! Hope you have a wonderful week! Green is my favorite color, so this look immediately drew my eye. This top looks great with the pleated skirt and I can see why you like it with denim, as well. I love your sandals..so cute! Have a great Monday! Green is one of my favorite colors! I love a summery top with a full skirt, it seems so old fashioned and is really comfortable. You look fabulous! Peace! This top looks wonderful on you! The whole outfit is gorgeous and looks comfy. So happy someone is loving and wearing that pretty top. That green top is a beautiful color on you Patti, you really are a master at finding those perfect pieces! Thank you for hosting. I love this outfit, that skirt and top are so flattering on you! Dearest patti, such a joy to join you once more. You wear these jewel tones so well. It’s still a bit cold here so I dream of the warmth you get there, although I wilt in the heat. Your hair is fabulous! That company has lots of great pieces. Thanks for hosting again, Patti. such a lovely top, and you look fabulous in Green!, love your pleated skirt and those cute sandals!, you look pretty comfy&cool, fresh and elegant!! Beautiful Anthropologie top! Thank you for the linkup party. Hi – I would love to chat with you about a collaboration but I couldn’t find your email. Please email me at johanna@oakstsocial.com Thank you! Patti, I love this! But I’m pretty sure you swamped this in Vancouver (since I remember bringing this top). It makes me so happy to see how wonderful you style it. It definitely found the best home ever. You look comfortable and well put together, Patti! Very pretty color combination and feminine flair! That’s a great top! It looks wonderful with the skirt! That does look pretty on you, Patti. Very fresh and cool. SWEET! You look adorable Patti! Those colors look fantastic on you and the whole look is fabulous. The style of your top is great for warm weather and is an easy layer under a cardigan if the temps get chilly. Thanks for the inspiration and for the link up. That green is lovely. It’s not quite that warm here yet but I am thinking about the summer. I like linen which means I iron a lot, even during the summer…..so it goes with natural fibers, I guess. I’m a huge fan of fun, print shirts!! Especially when they don’t get wrinkly!! Although at least the prints will hide the wrinkles somewhat, LOL! Really cute warm weather look, Patti! thanks for the linkup and have a great week!